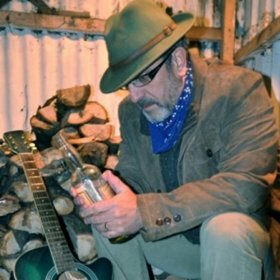 ‘Wasted and Alone’ is a collection of songs from Andrew Harris, that was written and recorded in 2008 and 2009, and features the spirited performances of Mr H on vocals and guitar and one man band John David, who not only produced the collection but also provided drums, bass, strings and percussion. There are some good songs on this album, and the guitar playing on such songs as ‘Roses in July’ is complicated and compelling, whilst the vocal has something of a more family friendly Tom Waits. The rock pastiche of ‘Joe Meek’ and the pseudo distorted jazz of ’45 Minutes’ show Mr H’s range of influences. and ‘Jack Cracker’ shows some deft, intelligent jazz guitar, and set closer ‘Lady Day’ is an almost spoken word piece, with a relaxed back-beat, and an almost cabaret like ambience. At an album’s length, though some of the songs blend into one another, and the vocal stylings become a bit too much over a lot of time. I would suggest that Mr H works at a vocal style that takes less of a toll on his vocal chords, and perhaps begins working with a full band, as more contributors would make the album more varied than it currently is. What you’re getting into is the new album from Shannon Curfman, and it finds the singer songwriter and guitarist building upon her already strong live and recorded performance reputation. However, it is one of those albums with a strong start, some good tracks, but the two weakest tracks right at the end. Songs such as the title track, ‘What you’re getting into’, ‘Curious’ with its almost rap like vocal and ‘What would Mama Say’ all feature strong vocals and playing from Curfman and her strong band, while well chosen covers of Eric Clapton’s ‘The Core’ and Peter Green’s ‘Oh Well’ show that the 1960’s blues boom was as important to Curfman’s development as anything that happened later in her own country. The weak choices at the end of the album are a version of Brian May’s ‘Dragon Attack’ which highlights a strong groove over lyrical coherence, whilst ‘Strange’ features lyrical existentialism but it is saved by a strong guitar solo at the end. All in all, I would recommend this album for the first 8 tracks, and just say in this case, less would definitely have been more. “Everything Changes” is the latest in a series of albums from the singer-songwriter and Harmonica virtuoso Will Tang. The CD covers the ground from heartfelt slow ballads such as the title track and ‘On my Way’, to the reggae of ‘Something Special’, the primal blues of ‘The Other Side’ the funk of ‘Love Bites’ and the feel good pop of ‘Troubles down’. Accompanied by a talented group of three multi-instrumentalists, Will Tang brings his songs of relationships to life. this is an album that hops between genres, with something to please most music fans, but purists may feel that it is too thinly spread over the genres. With good playing, and good production the band members are given a chance to shine, with Patrick Murdock’s colourful contributions on Dobro and Hammond Organ being particularly to the fore. The solo Harmonica piece ‘Sundown’ shows flawless playing and is a suitable ending to the album, save for the two remixes that finish the album. More information about the artist is available at www.willtang.co.uk.